Authentic, fresh and healthy Mexican food. 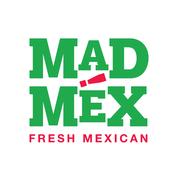 Mad Mex combines the authentic flavours and spices of Mexico with the health-conscious cuisine of California. Choose from a range of authentic, fresh and healthy tacos, burritos, nachos and quesadillas filled with roasted, grilled and slow-cooked meats, all perfectly complemented by your favourite Mexican toppings and hand-made salsas. The Mad Mex 1-2-3 step menu is fully customisable allowing customers to build their meal to their individual tastes or specific nutritional needs. The fully licensed venue also offers signature $9 margaritas made with 100% agave Hornitos Tequila, a range of local and imported cervezas (beers) and a selection of Jarritos, an imported Mexican soft drink. Kids menu and catering are available.